The above graphic describes the conventional messaging architecture; however, technology enables us to provide messaging penetration. Let us imagine, a MR (Medical Representative) manages 100 doctors, and each doctor prescribes the promoted brands to 10 patients/month (it can be any number of products). Thus, in a month the MR gets about 1000 patients who consume the promoted brands. In reality, it will not as perfect as above. Alternatively, there can be 80 doctors giving 60% of the business or even the classical Pareto’s rule: 80:20. But this point is only as a caveat. In today’s scenario, most messaging and relationship management efforts are directed to the doctor (prescriber or influencer) for pharmaceutical products. c) Dialogue detailing with Yes momentum. 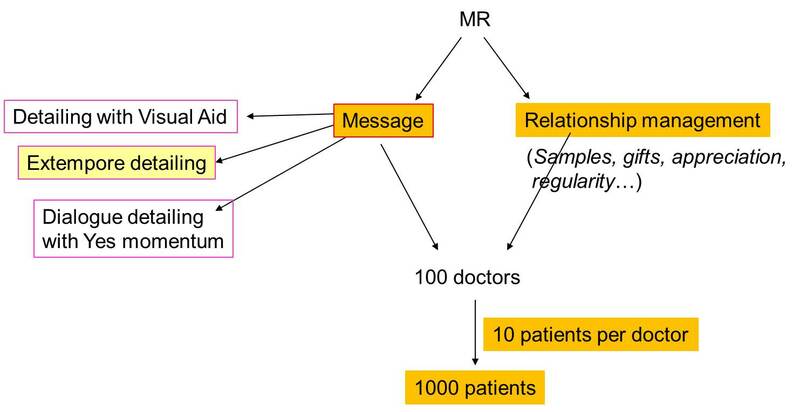 The realities and challenges to the MR in using the face-to-face in-clinic messaging routine are many: the well-established doctor gets atleast 300 different MRs every month. This is about 12 MRs per day (and if repeat calls by MRs are factored in, it could be more than 300 MR calls per month to the doctor). If each MR is given 5 minutes by the doctor, then, it works out to: 12 MRs X 5 minutes = 60 minutes per day! Now if a doctor is seeing 50 to 100 patients per day, you can well imagine whether he can afford to provide the 60 minutes to MRs, the doctor probably will offer only 60 seconds on a routine day (elevator pitch and no more!). It is not an exaggeration to state that it is a great challenge for a routine MR to obtain adequate time and mind-space of the doctor!! In fact, if the doctor gives 5 minutes per MR (and he has 12 MRs visiting per day, it is 60 minutes per day), then for 25 working days, the time for MRs would become 25 hours! It is doubtful if a doctor can afford so much time to MRs.
Pharma companies are attempting to work round this problem, these days pharma companies give their MRs only about 100 to 150 or less than 100 doctors to manage in a month, and there is emphasis on servicing, client management and repeat calls. In the 1990s and earlier, each MR would have to call on 250 to 300 different doctors per month. To compound the problem of a hasty doctor call made by the typical MR, is the fact that he does not normally use this limited time effectively - due to lack of application of communication skills, discouragement by doctors to apply his detailing skills, and to top it all there is an overall dip in basic work skills of MRs, in today’s pharma world. To overcome, such challenges, pharma marketers are on the earnest and constant look-out to use as many means of messaging and relationship management. This includes in-booth or in-stall activity, sponsoring CMEs, advertising on websites, and print and e- medical journals…all to get valuable mindspace for brand messaging and relationship management. Application of digital and other modern technologies to doctor-centric messaging and relationship management have limited scope, since doctors are hard – pressed for time. Doctors find it difficult to balance their professional pressures, need for constant updation of knowledge and their personal lives. Hence, application of tech enabled marketing messaging is difficult when it comes to doctors. One approach would be to gift a doctor a digital assistant that provides drug information (such as safety in pregnancy, drug-drug interactions etc on a portable palm top…and when a doctor checks up a drug the brand messaging can be done on the screen shot or at other points). Nevertheless, these devices may not be patronized by the doctor constantly, since most of the patient cases are handled by his expertise and doctors may not need a digital knowledge or prompter crutch. Young doctors may however find it a fancy for sometime atleast. For relationship management with doctors, the time-honoured methods are appreciating and providing positive strokes, giving samples, knowledge and brand updates (through literatures, reminder cards, CDs etc), small gifts, sponsorships, and ensuring medical representation is pleasing and regular. Such a MR call will ensure goodwill and catalyse doctors to favour the promoted brands. All in all, it boils down to a very challenging script to implement modern digital non-MR formats of messaging and relationship management. The marvels of information technology are such that it can catalyse messaging penetration to all other stakeholders! Let us say in above graphic, 1000 patients are prescribed either an anti-diabetic brand or an antihypertensive or an antibiotic. Now most of the pharmacies are nearby/adjoining the clinic, or at the hospital where the doctor prescribes. And when the patient presents the prescription, a software “sitting atop the billing software” collects the patient’s mobile number and email/postal address (this is entered by the pharmacist who feeds the information after obtaining permission from the patient/patient attender. For this effort the pharmacist can be given points, which can then be converted to a gift from the pharma company). The information thus collected from the pharmacist, is then sent by the pharmacist through autoemail or uploading (through wifi) onto the pharma company’s server. Using this information, the pharma company then sends regular brand sponsored messages that motivate the patient to take care of his or her health, or health tips through sms, or dosage reminders through sms, or reminders to take the medication before food and so on. This patient-centric messaging activity that is technology enabled, thus takes the pharma company’s messaging activity to the next level, adding depth to the messaging format of the company. Brand registration, brand goodwill and brand loyalty are also built through this messaging format at the patient level. This database can also be used for inviting patients for health related events conducted by the pharma company either by themselves or in collaboration with health NGOs. Example, a free yoga course for diabetics or a talk on millets and sampling dishes made from millets for diabetics…the possibilities are only limited by resources and imagination! This is not an additional marketing cost to the pharma company, it is brand building through ethical marketing messaging penetration upto the patient level. This approach will help secure the patients who are on the company’s brands. Further, this avenue of patient-centric messaging and relationship management will help make up for the challenges in pharma marketing to doctors. This will earn pharma brand owners great goodwill and brand loyalty (and strengthen corporate equity too). One can loop the doctor in above communication strategies and events. Cross-selling opportunity: If an antibiotic is prescribed to patient X and if this registers on the pharma company site through the pharmacy, there is an opportunity to touch base with the patient to cross-promote a safe nutritional supplement (eg., a B complex vitamin tablet or a health drink containing a pro/prebiotic to strengthen the gut, overall well-being and energy of the patient, since antibiotics do cause weakness and other side-effects.). The database verily opens up an opportunity for cross-selling of various nutritionals or allied products (eg., a specially formulated toothpaste for diabetics (mouth is the index of the body! )), or aids (such as diabetes friendly slippers etc), or even special foods such as VCO (virgin coconut oil)! If an antifungal is prescribed, a special antiseptic soap can be promoted!! While mapping data of patient purchase behaviour from the pharmacy is a fool-proof approach, since the sale of a target brand has actually occurred, patient – centric communication can also be generated from the doctor, if he is persuaded to upload patient data on company website. Certainly, there can be more than one approach to collecting patient – centric data and then adopting brand messaging approaches. A unique challenge in India, is the language … one must find a method to message patients in the preferred language of the patient! The central idea of marketing is to devise methods to create, communicate and deliver value so that customers are created, retained, and the exchange process is catalysed, benefiting all stakeholders. Marketing is also about product penetration and increasing through-put from a customer. The soul of marketing is creating customer delight. Patient – centric communication as described above is another foray into the ever dynamic world of creating confidence and satiety in patients. Thus, in the above hypothetical model we see a certainly ‘doable’ patient-centric brand communication and brand bonding exercise. It is an example of marketing message penetration, taking the brand message next level, to patients through modern technology. Kindly recommend this blog to your acquaintances, read other posts by scrolling down and clicking on older posts as required.